“Svoy bizness” magazine published a story about the Visual Science company. In Russian. Popular Russian website “The Village” published an article about the Visual Science studio. The story about Visual Science is published in the December issue of the RBK magazine (in Russian). Despite minor inaccuracies this is an interesting view on our work. GSEA-Russia posted a short video about the Visual Science company. Russian TV channel OTR made a video about the Russian GSEA-Awards 2014 and the Visual Science company. Ivan Konstantinov, the CEO of the Visual Science company, was named the best young entrepreneur in Russia on the Entrepreneurs’ Organization’s Global Student Entrepreneur Awards. ITAR-TASS media company published a video about the adenovirus model made by the Visual Science for the State Darwin Museum in Moscow. State Darwin Museum in Moscow (the largest natural history museum in Europe) introduced the Human adenovirus model, created by the Visual Science and its visual aids production studio. The model is made of transparent polymers and precisely reflects the structure of the viral capsid. The project won the first place in the contest “Interactive Museum in the XXI Century” that was organized by the “Dynasty Foundation”, the first private nonprofit foundation supporting science and education in modern Russia. The work on the museum display was supported by the foundation. Human adenovirus model is part of the Viral Park project and now published on our website both as an interactive application and a set of illustrations. Visaul Science took part at the EdCrunch conference in Moscow. The event focused on the new technologies in the sphere of education. This short video shows the studio CEO Ivan Konstantinov speaking about the Visual Science activity (in Russian). Visual Science took part at the Science Festival in the Lomonosov Moscow State University. This event was organized by Ministry of Education and Science of Russian Federation, Moscow Government and MSU. Several photos are available on our Facebook page. Well-known German magazine Der Spiegel used illustrations of the Ebola virus made by Visual Science in the issue that discusses the fever outbrake. Illustrations were published in the Zeit magazine as well. We finished our work on the interactive web-application “Human Skull”. It is the first widget based on our new technology which combines the unprecedented level of visualization quality and the possibility to rotate the model and highlight its different elements. 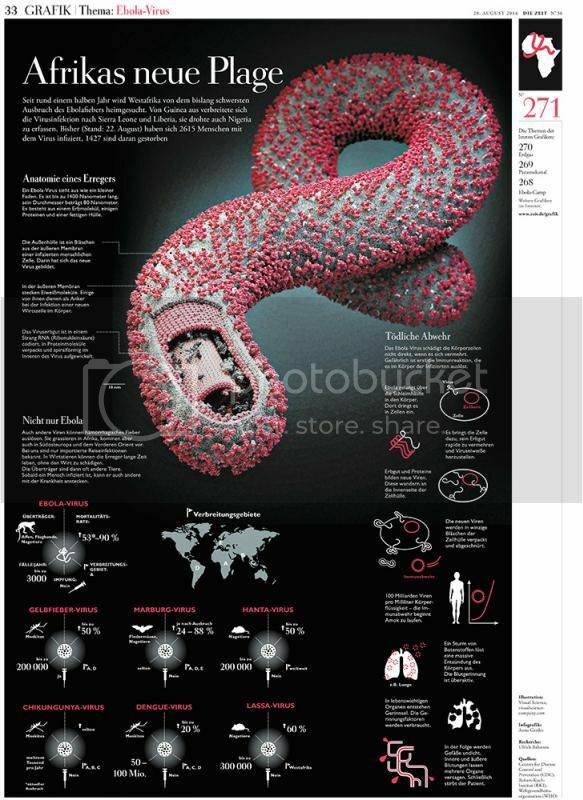 The SEVC honorable mention Ebola virus poster, created by Visual Science in the year 2011, was published on the website of the Washington Post, as well as in the Zeit magazine and on the webpage of the Science magazine’s Special Collection dedicated to the Ebola outbreak. Visual Science designed the instruction manual for the microbioreactor “Homunculus”, which is developed by the SRC BioClinicum. Next animation for the NovoNexus company is now published. The video demonstrates the effect of hyaluronic acid injections into the skin and describes the procedures carried by a cosmetologist. This video may be of interest for both professionals and general public. We created a video about the botox injection procedure for the NovoNexus company. It s made both for professionals and a wide audience. We are happy to introduce our official channel on Vimeo. We started to experiment with short looped videos on Coub website. We believe that this format may fit very well to demonstrate the working cycle of some enzymes and proteins such as hemoglobin. We published a first part of our story about modelling of 3D viral particles on the famous Russian IT blog Habrahabr. Our next posts will be dedicated to the biomedical and scientific visualization in US, Canada and Europe. We will also write about science art and educational materials in the sphere of medicine, biology and molecular biology in particular. The goal is to popularize the sphere among Russian audience that is not really familiar with it. Ivan Konstantinov, the CEO of Visual Science made a presentation about the company at the Moscow State University Economic faculty on the April 10th. The talk was a part of the “Bioeconomics, biotechnology, eco-innovation and high-technology business” session. We introduce the image gallery of small compounds found in different regions in Space. These small molecules may be important as precursors for synthesis of the crucial life chemicals such as amino acids, nucleotides, fatty acids and carbohydrates. Finding such “life precursors” in distant Universe may shed light on how Earth became habitable. The gallery was timed to the annual NASA Space App Challenge, during which NASA is looking for ideas, volunteers and collaborators for various projects in space science. Visual Science made a number of short educational animations for the project “Perioperative Medicine for the Junior Clinician”, which is developed by Monash University in Melbourne together with Wiley Publishers and the oldes Australian hospital Alfred Helath. Animations demonstrate the types of Le Fort fractures, oxygen binding to hemoglobin, immunoglobulin G molecule and some other objects. Here are some examples in HD. And we have great feedback. We developed a style and a set of promotional materials for medications Calcium D3 Nicomed and RioFlora series, which are produced by the largest Asian pharm-company TAKEDA. Materials include brochures, booklets, roll-up, posters, banners and even a medical representatives uniform. Yury Stefanov, the scientific consultant of our studio made a presentation on the winter Future Biotech school on the January 31st. Yury’s talk was about the scientific background of the non-profit project Viral Park. The most scientifically precise 3D model of the influenza virus ever created. The fourth member in Viral Park family (among HIV, Ebola and HPV ). The expert board of The Dynasty Foundation supported the creation of the scientifically accurate plastic model of the human adenovirus for the State Darwin Museum in Moscow. The Dynasty Foundation is the first private nonprofit foundation supporting science and education in modern Russia.